The online version of this article ( https://doi.org/10.1186/s13229-018-0220-x) contains supplementary material, which is available to authorized users. From early infancy, children with ASD show atypicalities in social communication, such as lack of human face preference over objects, and neurophysiological indices of face processing have been suggested as a potential ASD endophenotype [6, 7, 8, 9]. In childhood, individuals with ASD perform poorly in facial emotion recognition across multiple expressions , face recognition, and discrimination [11, 12, 13, 14]; therefore, such children may employ different neurophysiological mechanisms for face processing than typically developing controls [15, 16]. Early stages of face processing in ASD have been extensively studied using event-related brain potentials (ERPs). This methodology provides direct measurement of neuronal activity with millisecond time resolution and thus permits the detection of the timing and magnitude of neural responses corresponding to distinct stages of cognitive processing. The processing of facial stimuli is reflected by the prominent ERP components P1 and N170, peaking within the first 200 ms after a stimulus onset [17, 18, 19, 20, 21, 22, 23]. Multiple studies have reported abnormalities in these components in ASD populations [16, 24, 25, 26, 27, 28, 29, 30, 31]; however, a systematic review pointed to discrepancies in the results ). A recent meta-analysis of N170 characteristics in ASD indicated that only delay in N170 latency consistently differentiated ASD from controls; however, even this effect was of a small size . Here, we performed a more focused analysis of data from published studies narrowed on theoretical grounds to include only those related to face versus object superiority and face inversion effects. The heritability of behavioral measures of face preference has been supported in recent twin research . It has also been suggested that relatives of ASD probands have impaired face recognition and atypical patterns of face processing, as observed in ASD-affected subjects [46, 47, 48, 49]. Moreover, studies of unaffected twins [6, 50] have demonstrated heritability of ERPs elicited by faces, including both neutral and emotional expressions. 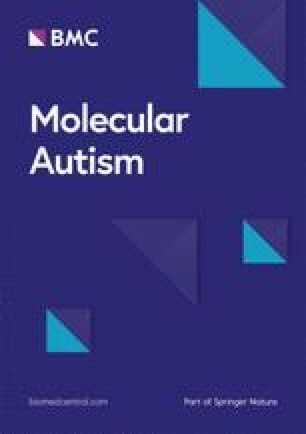 Familial aggregation of face-sensitive ERP characteristics has been observed among the parents of ASD probands . Our study examined familial aggregation of an array of ERP characteristics related to face processing which have been previously implicated in ASD. Consistent with available reports [23, 25, 27, 29], we hypothesized that these ERP characteristics would be observed in our ASD subjects, and that unaffected first degree relatives of individuals with ASD would exhibit attenuated versions of these effects. This would provide data consistent with a general hypothesis that face-related ERPs reflect genetically transmitted risk for ASD. Another aim was to clarify the effect of the electroencephalography (EEG) reference type on the hypothesized group differences. Historically, ERP studies of ASD have employed different reference schemes, and this may have contributed to discrepancies in their findings. The choice of reference electrode is known to have substantial effects on local EEG [51, 52, 53] and particularly on face-related ERPs . There is currently no universally accepted “gold standard” and the selection of reference scheme for studies of face-related ERPs in ASD has been highly inconsistent. We undertook a systematic re-appraisal of published results, taking into account this often-overlooked confound. The use of multiple reference schemes in the original data collection described in this report enabled the comparison of our results with previous studies that have employed distinct reference schemes for quantifying various ERP associations with ASD. From 23 studies of the N170 component in ASD identified by a recent systematic review , nine [16, 24, 25, 26, 27, 28, 29, 30, 31] included a comparison of the ERP response to upright face stimuli with responses to either inverted face stimuli or non-face objects. Of these nine studies, eight [16, 24, 25, 26, 27, 28, 29, 30] assessed the face over object superiority effect and five [16, 27, 28, 29, 31] assessed the face inversion effect (Table 1). Extending the previous review , we calculated weighted effect size of between-group differences assessed from the published data. The GPower program  was used to estimate the minimum group size needed to detect the effects of interest with at least 80% power and alpha of 0.05. 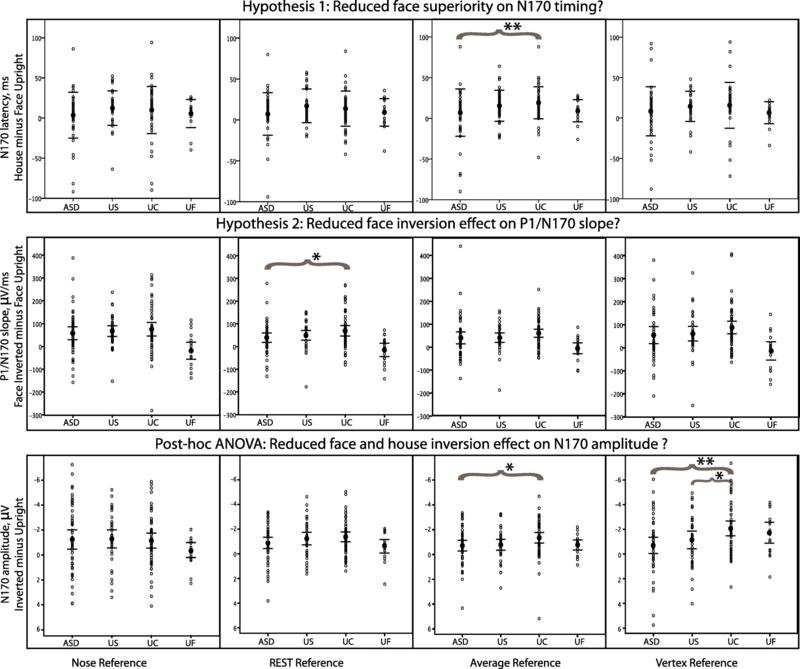 A second purported ERP abnormality, diminished effect of face inversion, as reflected in either P1 or N170 amplitudes, was not supported by the accumulated literature. P1 amplitude inversion was examined in four studies [27, 28, 29, 31] with only two reporting significant group differences [28, 29]. Weighted effect size estimation also did not support the hypothesis that the reduced P1 face inversion effect is a distinguishing characteristic of ASD (Additional file 1). The N170 amplitude inversion effect was examined in five studies [16, 27, 28, 29, 31], among which only one reported a significant group difference . The weighted average effect size from those studies (two negative and one positive) is 0.35, corresponding to small effect size. 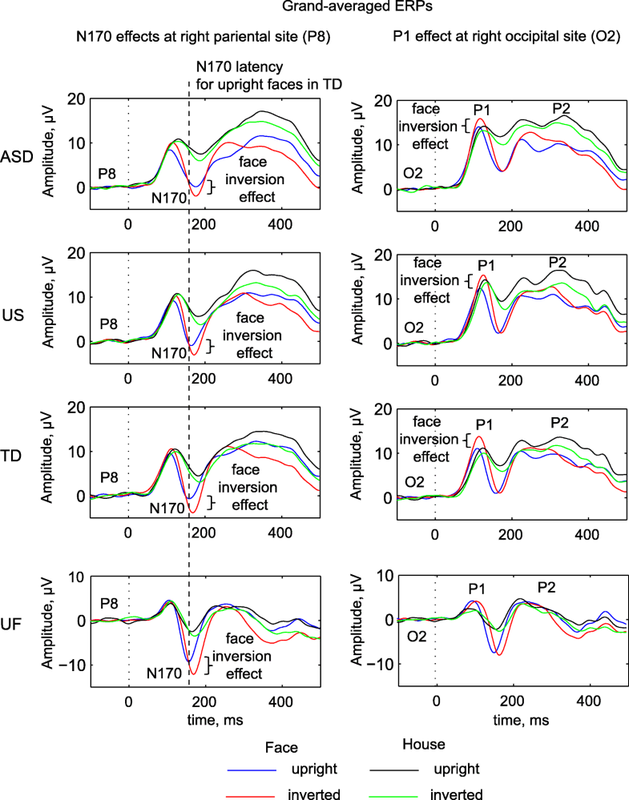 However, a new composite measure of face inversion effect introduced by Webb et al. , the P1/N170 slope, showed a better discrimination between ASD vs. TD. This measure combines P1 and N170 components affected by face inversion and, as noted by Webb et al., “takes into consideration the peak-to-peak change in amplitude over the peak-to-peak change in latency” . This slope index differentiated ASD from neurotypical controls with an effect size of 0.63. Corroborating previous findings in the general population, the N170 component was significantly larger and peaked earlier for faces than for houses, predominantly at the right posterior sites [17, 18, 19]. 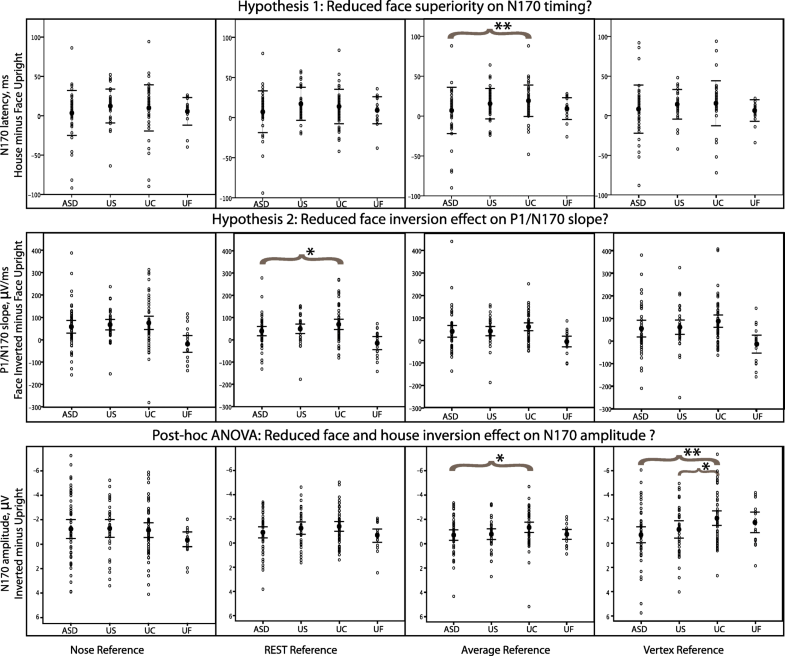 The face inversion effect on N170 reported in previous studies (e.g., [17, 18, 19]) was also well replicated in the present study, although our findings challenged its specificity to faces: N170 amplitude was larger for inverted compared to upright images of both faces and houses. We confirmed the sensitivity of a new measure, proposed by Webb and colleagues , the P1/N170 slope, to face inversion and extended this finding to the child population: the inversion effect on P1/N170 slope was larger for faces than for houses. Furthermore, our study supported face-related effects on the P1 component [20, 21, 22, 23]: P1 latency was shorter for faces than houses, and inverted faces elicited larger P1 than upright faces and houses. The P1 effects were not specific to the right hemisphere and observed both at the left and right occipital sites. It is important to note that P1 and N170 latency facilitation effects for faces were not correlated, suggesting that the “face processing advantage” begins as early as 120 ms post-stimulus and involves distinct underlying mechanisms at different stages of information processing. Our analyses revealed a substantial impact of EEG reference scheme on the results of comparisons between ASD and UC subjects with respect to the studied ERP components. Analysis of published literature (Table 1, [16, 24, 25, 26, 27, 28, 29, 30]) showed that five out of eight studies reported a reduced “face over object superiority” on N170 latency among ASD subjects with a weighted average effect size of 0.68. Our present data supported the reduction of the face superiority effect in ASD group as confirmed by Bayesian analysis but only under the average EEG reference scheme. Noteworthy, all studies that reported this effect previously also used the average reference, while two out of three remaining studies [26, 30] utilized a nose reference. Thus, our findings suggest that N170 latency abnormalities in ASD are sensitive to the reference scheme, and the average reference appears to be optimal for detecting that effect.